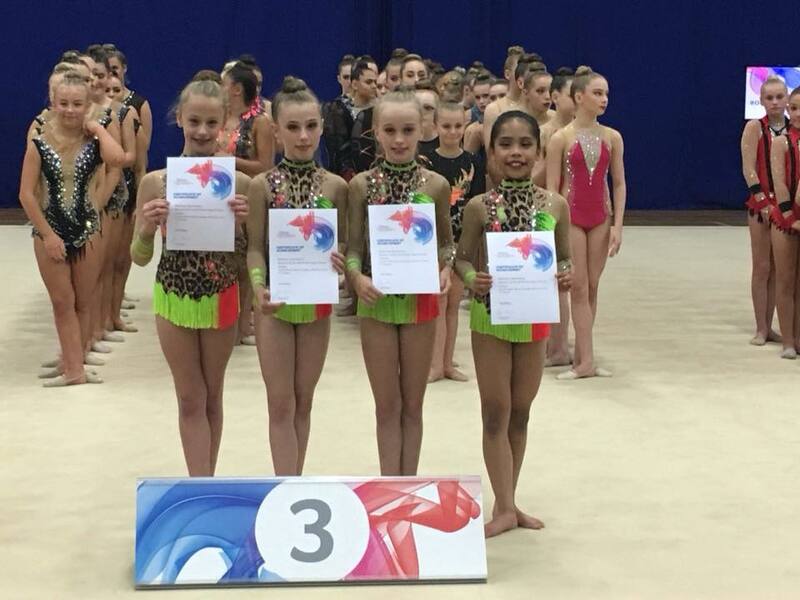 There was further success for three of the Region’s rhythmic clubs at Round 2 of the 2018 Group Leagues. 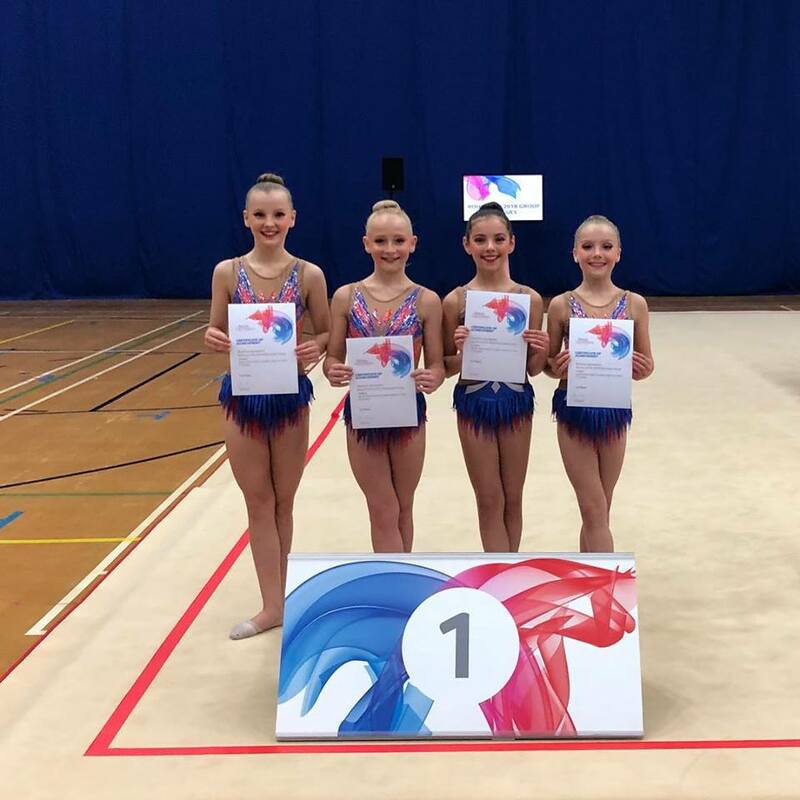 Worcester Red (Mia Harding, Elodie McNelis, Georgia Smith and Eva Yordanov) finished first in the Elite Espoir section by top scoring with both their Free and Ball routines. In the same section, Elena (Kiah Everett, Maisie Kellett, Sophie Marley and Francesca Tacud) finished third and Worcester Purple (Jessica Bettles, Scarlett Bunn, Athina Davis, Lucy Jackman and Amber Whittaker) fourth. There was also a fourth place finish for the City of Birmingham Gems (Ayumi Dunbar, Hannah Jordan, Tasia Murray, Allie Neal and Aavni Patel). In the Elite Junior competition, the City of Birmingham’s Junior Stars (Daisie Burke, Jessica Dodd, Amalie Howard, Alarna-Jai Turton and Olivia Whatmore) produced two solid routines (Clubs and Ribbon) to finish second behind the current British Junior Group Champions, while in the National Junior League, the City of Birmingham Pearls (Channel Berry, Camone-Bleu Gordon, Emma Iankova, Amelia Jordan and Miya Walker) finished third. The City of Birmingham Seniors (Nicole Allen, Jess Bateman, Sophie De-Bear, Natasha Hodson and Lauren Moult) finished second in their section and produced the day’s highest scoring Hoop routine. The third and final round of the Group League takes place over the weekend of November 24th and 25th. In the Elite Espoir section, Worcester Red are currently sitting in second place, Elena in third and Worcester Purple in fourth. The City of Birmingham Gems are currently fourth in the National Espoir league, the City of Birmingham Stars lead the Elite Junior division with the Pearls third in the National Junior section, and the City of Birmingham Seniors are second in their league.